When a single speaker has to deliver a message to hundreds of people through a conference system, the microphone has to be the very best. The d:sign™ Series delivers remarkably clear sound with optimum rejection of background noise. Enabling outstanding sound in acoustically-challenging spaces can be very tricky. But choosing the proper microphones makes everything easier. The right mics can minimize potential problems before they pop up and guarantee customer satisfaction after project close. Whatever the setting, DPA supercardioid mics combine controlled directionality with excellent rejection of background noise into an elegant mic solution for even the most difficult space. This series contains two complete installation solutions: One for the ceiling, which is ideal for mounting from the ceiling of meeting rooms and other small to mid-sized spaces; and a tabletop solution that can be temporarily or permanently placed on a table or other flat surface. A complete cardioid mic floor stand solution in the modular d:sign™ Microphone Series offers a high-quality stage voice or instrument mic. These solutions look elegant onstage and the cardioid or supercardioid pickup pattern of the mic ensures that the entire room can focus on the talent. When high speech intelligibility is paramount, d:sign™ Gooseneck solutions are ideal. 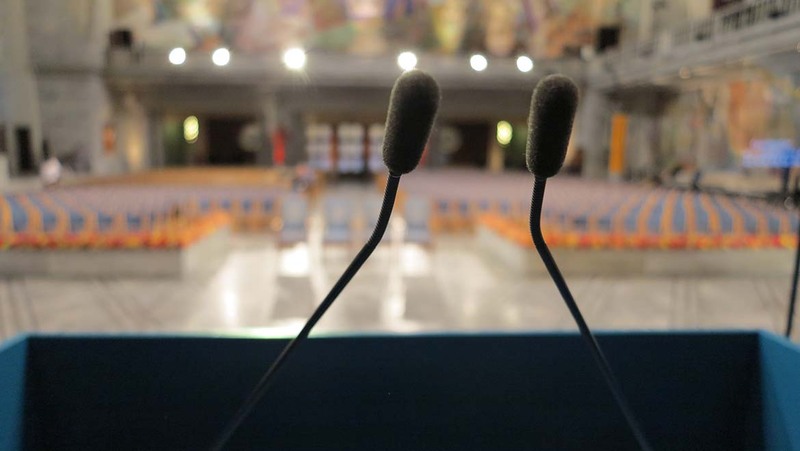 From parliaments to conference centers, boardrooms to video conference rooms, DPA mics give you trouble-free installations and deliver pristine, clear sound. 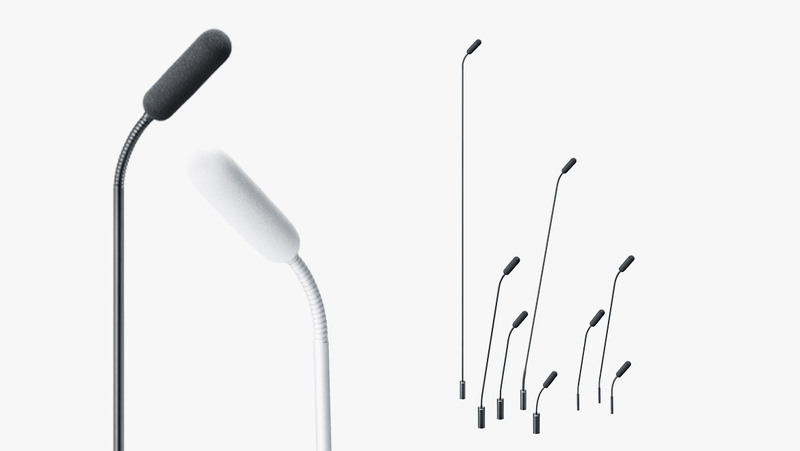 This mic solution is ideal for use in boardrooms, conference facilities and courtrooms. It is also a great solution for teleconferencing and other applications where excellent vocal pickup is required. 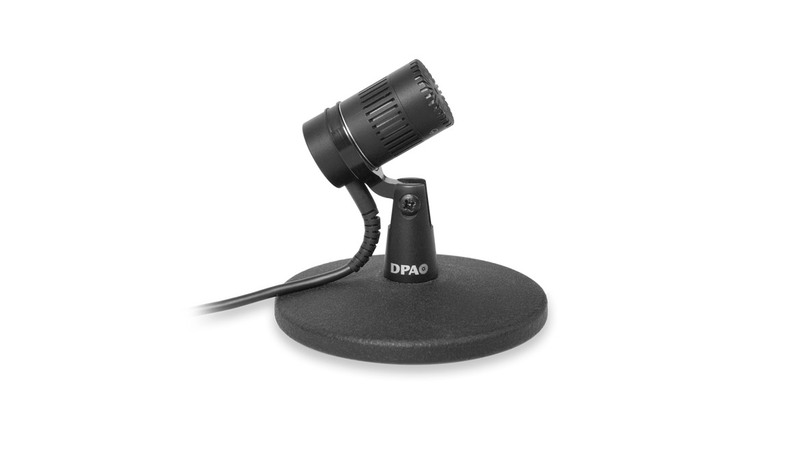 Are you ready to buy a DPA microphone for installation? Find the store closest to you. 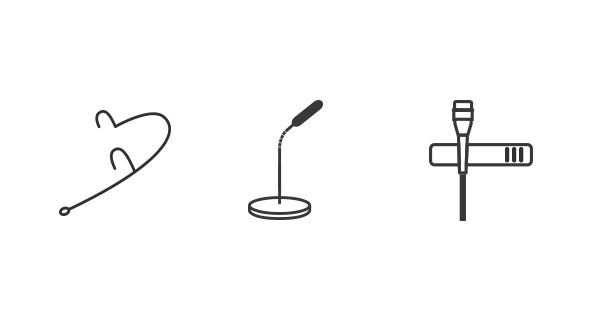 Our podium microphones provide linear, natural sound combined with elegant visual design. They also offer unparalleled modularity: use them to amplify an entire audience one day and a single speaker the next. The microphones' remarkably clean sound provides high intelligibility with the rejection of background noise. 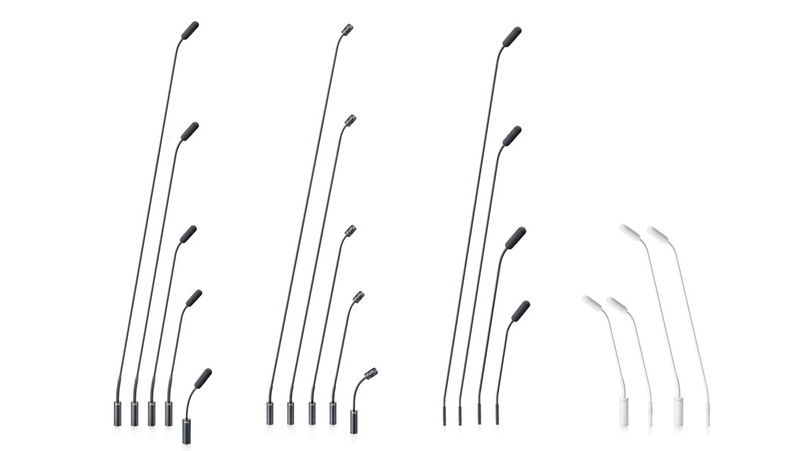 The d:sign™ Series for wired installations is a fully modular microphone series, including different directionalities and preamplifier choices. Our standard high-end configuration is the MMC4018 Supercardioid Capsule with MMP-F Modular Active Boom. This solution is available in many variants to meet your specific needs. It comes in lengths of 15 cm (6 in) for hanging solutions, 30 cm (12 in) to 45 cm (18 in) for podium solutions and 75 cm (30 in) to 120 cm (48 in) for floor stand applications. Custom variants, to meet your exact needs, are also available. Supplied with either a XLR connector or our MicroDot connector, d:sign™ Installation Solutions are well suited for both wired and wireless microphone setup. With the MicroDot configuration, no more cables across the stage; simply connect the microphone with one of our adapters for a wireless transmitter and your setup is more flexible than ever. With very low noise and a high sensitivity, d:sign™ Installation Solutions offer the most clear, transparent, and natural sound available on the miniature mic market. The mics are capable of handling extremely high SPL before clipping. With a linear response, low distortion and an extremely large dynamic range, they sound great no matter how challenging the environment. 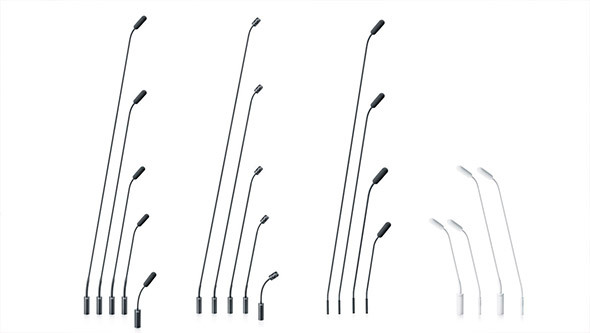 These d:sign™ Installation Solution Mics are available in many variants to meet your specific needs. Lengths range from 15 cm (6 in) to 45 cm (18 in). Longer black variants are in 75 cm (30 in) and 120 cm (48 in). Custom variants, to meet your exact needs, are also available. d:fine™ Headset Microphones set the standard for bodyworn headset microphone solutions. They are ideal for public speakers and sound engineers who insist on superior voice reproduction, comfort, easy setup, and a discreet look. 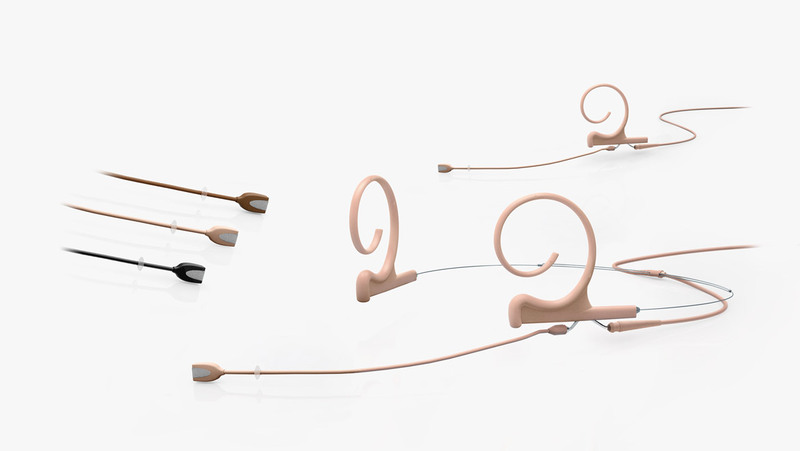 d:fine™ Headset Microphones are offered in single- or dual-ear mounts to cover a broad range of applications. Our d:fine™ Omnidirectional Headset Microphones are for situations where a broad pickup pattern is essential and off-axis noise is not a problem. Our d:fine™ Directional Headset Microphones offer maximum side rejection and excellent sonic focus on the subject. When the aesthetics of the meeting space are as important as the audio quality, the d:sign™ SC4098 Supercardioid Podium Microphone, together with the stylish Microphone Base, is the right solution. 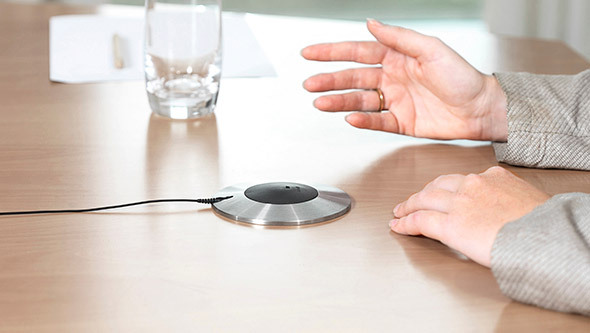 Unobtrusively mounted on the ceiling or elegantly embellishing the meeting table, the d:screet™ ensures that every participant is heard and understood. 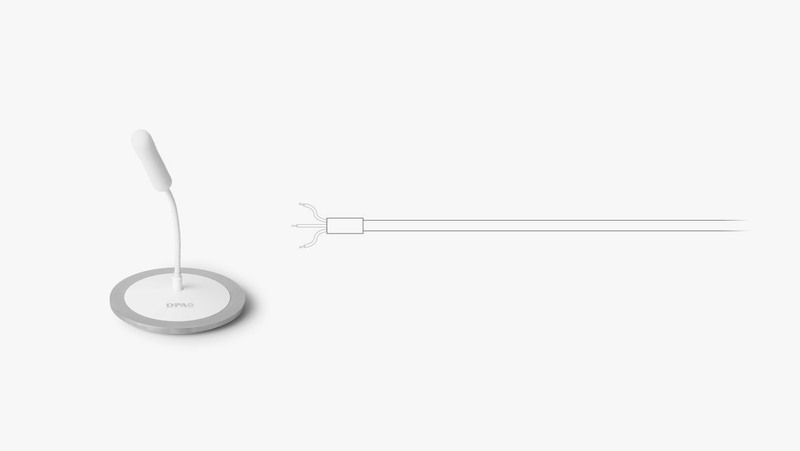 The Microphone Base can be used with any of our gooseneck microphones with a MicroDot connector as the output, though it is made especially for the d:sign™ Gooseneck Microphone. 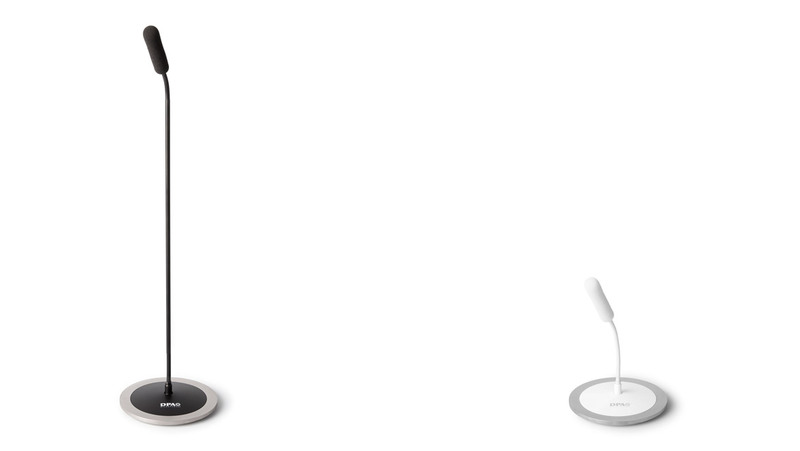 The Microphone Base has an elegant yet unobtrusive design with a black or white, non-reflective surface. With very low noise and a high sensitivity, the microphone offers the most clear, transparent, and natural sound available on the miniature mic market. 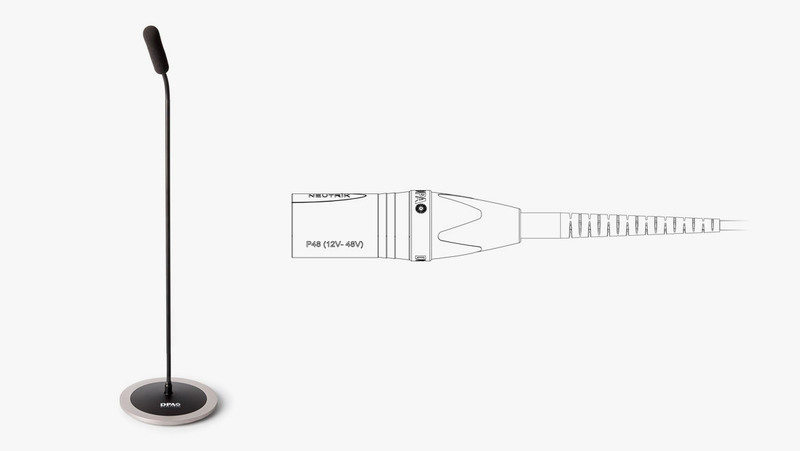 It is capable of handling extremely high SPL before clipping. With a linear response, low distortion and an extremely large dynamic range, they sound great no matter how challenging the environment. 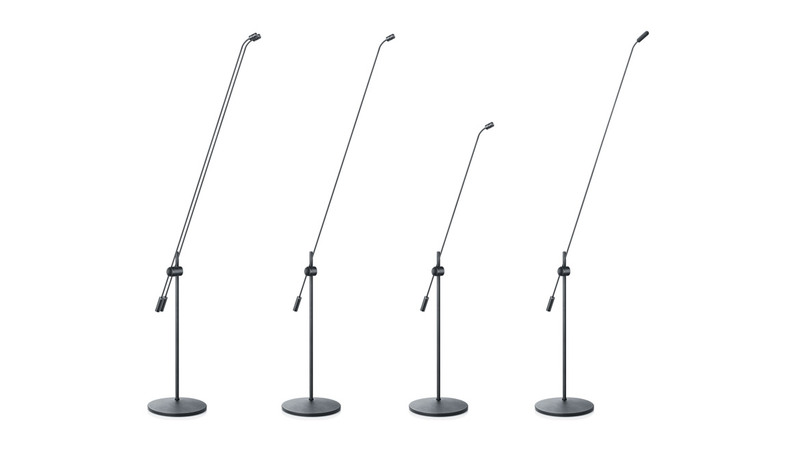 We recommend the use of microphones in these lengths: 16 cm (6 in), 28 cm (11 in), 43 cm (17 in). Longer goosenecks should be avoided. 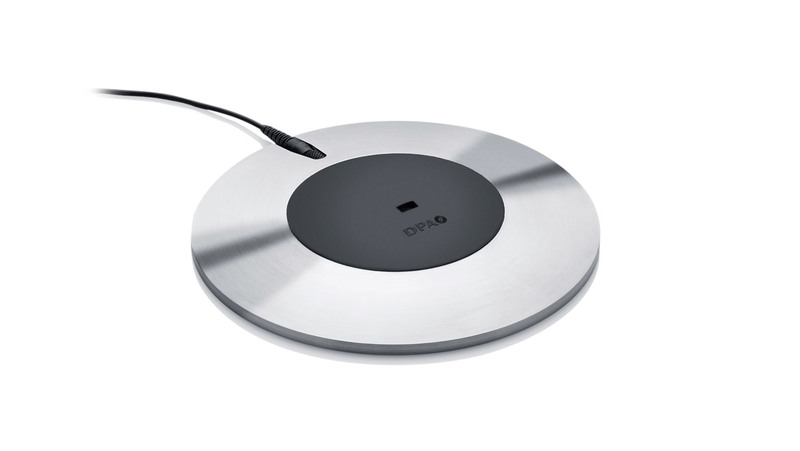 A complete, supercardioid ceiling microphone solution, which is ideal for mounting from the ceiling of conferences venues, meeting rooms, board rooms and other small to mid-sized spaces. 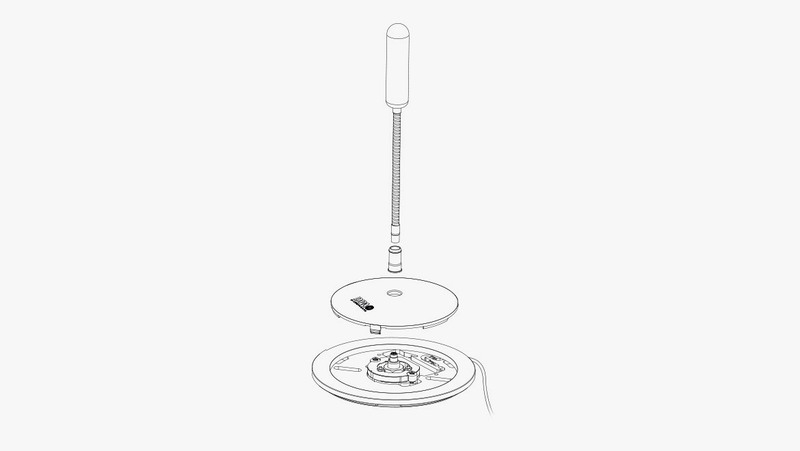 The Microphone Base fits most electrical back boxes and secures ease of installation. Furthermore, the great off-axis response and the physics of sound level vs distance, makes it possible to cover a small to mid-size room with only one or a few microphones. A complete, tabletop microphone solution. Ideal for either permanently affixing to or temporarily placed on a table in conference venues, meeting rooms and board rooms. This solution can be scaled up as needed. In smaller rooms you might only need one microphone to capture the best sound. In larger settings, you can use multiple d:sign™ Tabletop Microphones to ensure each area of the room is completely covered. The best audio quality is obtained in a one-to-one solution – one microphone position close to one speaker. Investing money in a purpose-built conference room or auditorium is a major commitment, but for companies that get it right this investment can bring huge benefits in terms of increased productivity.